← The Great Apache Chief, Cochise, Becomes A “Reservation Indian” To Save His People! Part II - This is the second in a series on the great Chiricahua Chief, Cochise, and his part in the fascinating history of Southern Arizona. For the First Part in the series, Please see the post on Cochise Becomes a "Reservation Indian". In February 1862, Captain Sherod Hunter led a company of Confederate soldiers, about 120 Texans, into the little town of Tucson in Arizona Territory and raised the Stars & Bars over the Presidio. In this way, Tucson became the capitol of the Western District of the Confederate Territory of Arizona. In May of that year, Captain Hunter led his troops out of Tucson ahead of an advancing Union Army of infantry, cavalry, and artillery units known as the California Volunteers led by Brig. Gen. James Carleton, a highly competent veteran of the Regular U.S. Army. The retreating Rebels headed back to the Rio Grande from whence they came. They followed the Butterfield Overland Stage route that had been abandoned a year earlier at the start of the Civil War. On that route was an important stage station at Dragoon Springs, as it was the only reliable source of water for many miles in any direction. It is located in the Dragoon Mountains about 16 miles east of present-day Benson. Present-day ruins of the Dragoon Springs Stage Station, including the four graves in the foreground. Again, note the location of the "shark fin" hill in the background. Hunter needed supplies, particularly beef, for his men. He sent a small foraging party ahead to round up any stray cattle in the vicinity of Dragoon Springs. 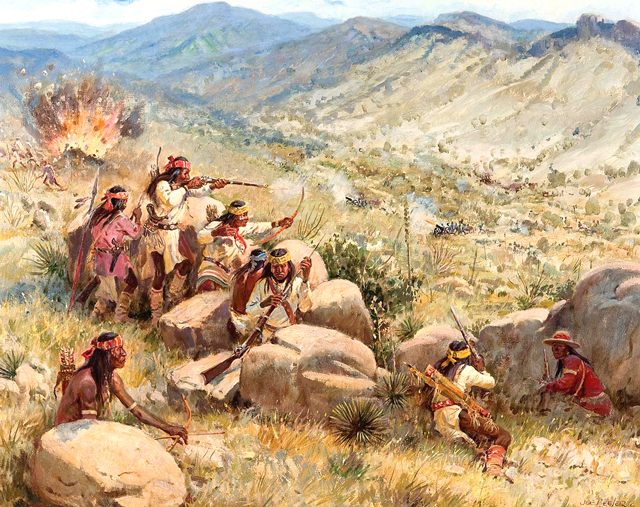 There they were ambushed by about 100 Chiricahua Apaches led by Cochise. The Chiricahuas killed one Confederate soldier and a Mexican stock herder that the Confederates had pressed into servitude. They then took 25 of the soldiers' horses and 30 mules. Ms Karen reads a (historically inaccurate) interpretive sign next to the Dragoon Springs Stage Station graves (1.3.15). All the historical signage out here was scheduled to be updated with historically accurate information. Four days later, on May 9th, Captain Hunter led the full force of his Texas Rebels to Dragoon Springs to re-capture their horses and mules and avenge their fallen comrade. They succeeded in getting their stock back and killed 5 Chiricahua Apaches in the ensuing battle. They then buried their two casualties of the first battle at the abandoned stage station: Sgt. Samuel Ford, and Ricardo, the young Mexican stock herder. Today you can visit the ruins of the stage station. One hundred feet north of the ruins are 4 graves. In the two outside graves are buried 3 Butterfield employees murdered by Mexicans in 1858. The middle graves belong to Sgt. Ford and Ricardo who were killed by Chiricahua Apaches in 1862. As of January 2015, the interpretive signs here contain some historically inaccurate data. An effort to update the signage is underway. Apache Pass as viewed from Ft. Bowie today. Having forced the Confederate Rebels out of Tucson without firing a shot, General Carleton spent the next 6 weeks securing the little town and preparing to chase Hunter’s troops all the way back to the Rio Grande. In mid-July, 1862, Carleton’s 1,800 California Volunteers followed the same route east that the 120 Rebels had followed in May. About 65 miles east of Tucson they too came upon Dragoon Springs. Fortunately, Cochise and his Chiricahua warriors were not there to greet them. However, in another 50 miles or so, they would have to travel through Apache Pass to get water at Apache Springs. Carleton was not taking any unnecessary chances. At Dragoon Springs he divided his command. He ordered Captain John Cremony to stay with the main force and its extensive wagon train of supplies, mules and horses. Then he ordered Captain Thomas Roberts to advance on Apache Pass with a small contingency of infantry, a few cavalry, and two 12-pound mountain howitzers. Roberts was to determine if Apache Springs had enough water to support Carleton’s entire command. Of course, Cochise could see them coming miles away and had plenty of time to prepare an ambush. Cochise wasn’t taking any unnecessary chances either. His warriors had been beaten by the retreating Rebels in the 2nd Battle of Dragoon Springs. So he joined forces with the Mimbreño band of Apaches led by his father-in-law Manga Coloradas (Red Sleeves). Now he had a force of about 200 well-armed, tough-as-nails Apache warriors. Anyone who has been to Apache Pass knows there are hundreds of gullies, boulders, and mature mesquite trees where the Indians could conceal their presence and behind which they would be nearly impossible to shoot. Moreover, the Apaches had built up substantial stone breastworks. Cochise thought he had planned for every contingency. At mid-day on July 15, 1862, Roberts’ infantry marched into the ambush and the Apaches opened fire from all sides. Roberts retreated, re-grouped, and advanced into the Pass. Fighting all the way, they got as far as the abandoned stage station. Built of thick rock walls, it offered them some cover. But the Indians still blocked their way to the Springs some 600 yards away. After a long march through the Sonoran Desert in the brutal July heat, the troops now desperately needed water. Nor did they have enough water to retreat back to Dragoon Springs. They had no choice but to fight. Cochise had them right where he wanted them. The Apache riflemen behind the breastworks on the hills above the abandoned Butterfield Stage station were delivering withering fire on the soldiers. 12-Pound Mountain Howitzer capable of firing exploding shells 1,000 yards. The Chiricahua had never seen a gun so big it had to be transported on wagon wheels. Under heavy fire Roberts and some of his men were able to get their howitzers into position to take out the Apaches stone breastworks 300 to 400 feet above them. They opened fire and bursting shells tore into the Apaches defenses. Cochise, brave and brilliant as he was, had not considered every contingency. In fact, he had never seen a howitzer, or the damage one could inflict. The Apaches retreated and Roberts and his men made it to Apache Springs. That night however, the Apaches attacked again. But a few well-places rounds from the howitzers scattered the Apaches once more. When the battle was over, Roberts reported only two of his men killed and two wounded. He counted 10 dead Indians. The Apaches later claimed that 63 warriors were killed by the howitzers and only 3 were killed by small arms fire. The soldiers went to work cleaning out Apache Springs and increased its flow sufficiently for all of Carleton’s men and stock. Carleton concurred and ordered the establishment of Camp Bowie, in honor of Col. George Washington Bowie, commander of the 5th Infantry, California Volunteers. In 1868, a more permanent and substantial Fort Bowie was established at Apache Pass to protect American soldiers and settlers traveling east/west across Arizona Territory. Cochise would war with the Americans for another decade. But by 1872, he had come to the conclusion that if he was to save his people, he would have to make peace.